Casa Kokopelli is a spacious holiday house on walking distance from the beach. Special tariffs for hibernators ! You can smell the sea ! 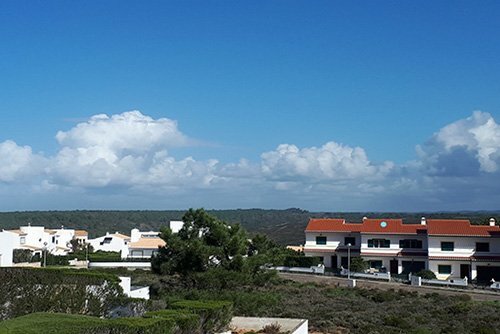 Casa Kokopelli is a well situated and spacious holiday house with 4 bedrooms in a peaceful residential area situated on a rock at the Atlantic Ocean in the South West Alentejo National Park on the Vicentina Coast. The house is situated between the beaches of Monte Clerigo and Amoreira. The beaches with surfschools and restaurants are on walking distance (10min.)! The authentic village of Aljezur is reachable by car within 5 minutes, at the foot of the Monchique hills in a beautiful green environment. There you can find quietness and have a walk in real nature!! All bedrooms have sufficient wardrobe space. Furthermore, there is availability of a cot. Terraces and garden with beautiful views are located as well as in the front as at the back of the house. You can see the sunrise from over the hills of Monchique. From out of the garden and balcony you can spot the sea. The garden provides you dayround sun and shade. There is availability of garden furniture and sun loungers. The fenced garden is safe for small children and provides much privacy. Also from out the kitchen, there is access to the terrace with barbecue. Due to the sea climate, air-conditioning is not needed or available. During the winter period electric heating is available at a charge.